A basic squash soup can be delicious on its own, or with a simple garnish of brown butter, chopped sage, or crumbled cheese, to name a few garnishes. But sometimes you might want a more complicated soup, or more than one flavor combinations for a party. One way to do this is to make a simple squash soup as a foundation, and then one or more “add-ins” that are compatible with the squash. The recipes below follow this idea, beginning with a basic squash soup (which might be enough for a true fan of winter squash), followed by two “add-ins”: something spicy from the southern Mediterranean, and something mellow from the northern Mediterranean. The first add-in — a North African stew — could also be good on its own. The second one — stewed leeks with garlic and sage, garnished with walnuts and lemon zest — might be great tossed with pasta. Peel the squash, remove the seeds, and cut it into pieces (the size isn’t important because it will be pureed later, but smaller pieces make faster cooking). Place the pieces into a bowl. In a large stock pot, saute the onion in the vegetable oil. When the onion is soft, add the bay leaf and squash pieces. Cover with water. Add salt (start with a teaspoon). Bring to a boil, then reduce to a simmer. Cook, covered, stirring occasionally until the squash is completely tender. Remove the bay leaf. In a blender or with an immersion blender, puree the mixture, taking precautions necessary for a hot liquid (especially important with a normal blender). Add more water or stock to reach the consistency you want. Keep warm until the “add-ins” are ready. Combine the cinnamon, turmeric, dry ginger, and cayenne pepper in a small bowl and place near the stove. Combine the garlic and ginger in a small bowl and place near the stove. Combine the carrots and potatoes in a bowl. Add 1/2 cup water. Heat oil in a large skillet or saucepan. Add onion and cook over medium heat until soft. Add the garlic, ginger and spices, cook, stirring constantly for about 1 minute (but not so long that the garlic burns). Pour in the carrots, potatoes and water. Sprinkle 1 teaspoon salt over the vegetables. Stir, then simmer for about 10 minutes. Add the cauliflower and stir. When the cauliflower has heated through, stir in the tomatoes. Cook uncovered for about 10-15 minutes. Fill a bowl about 2/3 full with the squash soup, then top with the spiced vegetables and some chopped mint and cilantro. Trim away the tough green leaves from the leeks. Carefully wash the leeks, being sure to remove any sand that got inside the leaves while they grew. One way to do this is to cut the leek in half, starting about 2 inches from the roots, then unfurling the strips under running water. If the leeks are very dirty, you should also clean them after the next step. Place the leek pieces into a bowl with 1/4 cup water. Pour some oil into skillet over medium heat. When hot, add the garlic, and cook for about 30 seconds, stirring constantly, until the garlic is barely golden brown. Add the leek pieces and water, stir a few times, then turn the heat to medium low and cover. Cook until the leeks are tender. Mix in the chopped sage. Salt to taste. Fill a bowl about 2/3 full with the squash soup, then pile on some of the leek mixture. Garnish with the toasted walnuts and lemon zest. 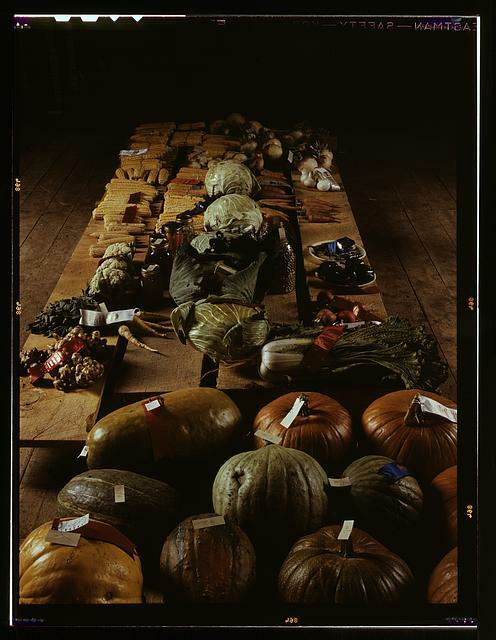 Image credit: Exhibit of crops and vegetables at the Pie Town, New Mexico Fair, October 1940, from the Library of Congress, Farm Security Administration – Office of War Information Collection, via The Commons at Flickr. No copyright because it was a work of the U.S. Government. For the African dish, check your local stores for "grains of paradise". It is the seed of an African plant in the ginger family, that was once a cheap replacement to black peppercorn which was (quite expensively) imported from India. While it's much milder than black pepper (most conversions I've seen say use x1.5 or x2), it also has strong hints of ginger and cardamon. It absolutely rocks Indian and some Asian dishes, and would fit in perfectly with the seasonings in this. Also… be kind to leek greens. The outer leaf or two are usually too tough to eat, but if you cut them diagonally to 2-3mm slices and cook longer than the whites, they are actually quite tasty, and have a good dose of beta carotene.